Sweet Tooth? Healthy Vegan Solution Here! It’s no secret to any of you that we can help animals by curtailing the number of them we eat. And when it comes to snack foods, you want something that’s healthy as well. When I have a sweet tooth, a favorite treat is a Larabar. They’re good for you and taste so good! But I couldn’t find my favorite flavor, Cherry Pie, anywhere around. And if I’d known it was this easy, I’d have been making them a long time ago! I used a recipe I found at Budget101.com. I used up the cherries before I decided to blog about making them. Oh well. Just add 1 cup almonds, 1 cup dates, and 1 cup dried cherries to the food processor and pulse for up to 45 seconds. You might need to add a couple teaspoons of water if the mixture doesn’t stick together well. Then transfer to a pan lined with parchment paper. 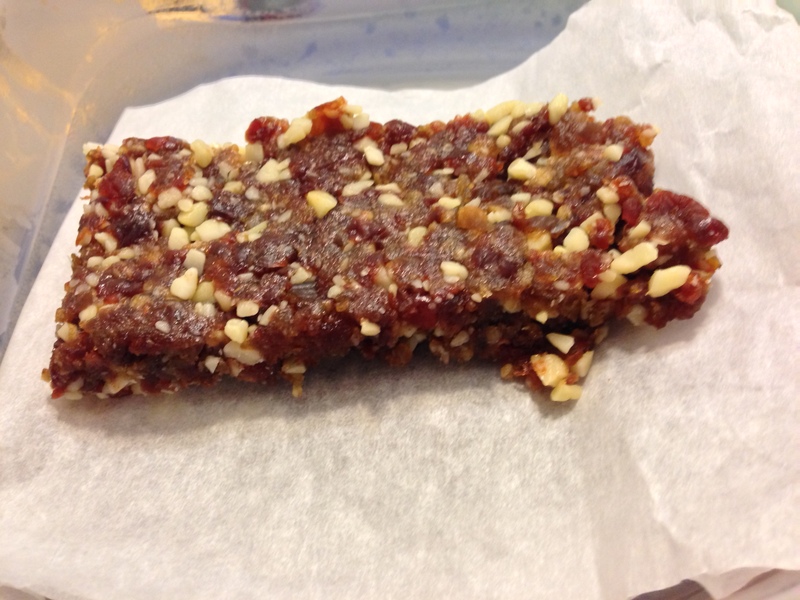 Press, allow to sit, and cut into bars. tastes just like the Larabar! I’m storing mine in the freezer. They also keep in the refrigerator or at room temperature. Or, if you love peanut butter cookies, try processing 1 cup roasted, unsalted peanuts with 1 cup dates. Delicious! You can find the recipe for over 20 varieties of Larabar at Budget101. « The Best News I Heard All Week! if she can eat raisins, she can use them instead! Glad to hear that. Chocolate is always required. They are, Kevin! But not so much for dogs. Dang, my Dad got real hungry for some reason! I had no idea it would be that easy to make those! Wow! Thanks for sharing! And I am definitely trying this out! I know! They are amazing, huh! Do you mean there are times when chocolate is NOT required? Really? That looks GOOD and sounds EASY… and if it is Cheaper… THAT Truly makes it a WINNER. Probably not if you choose organic ingredients. But I don’t. And you can use a variety of kinds of nuts, depending on taste and what’s on sale. Yum I am soooooooooooo hungry!! These sound so easy to make that even mom may make them. 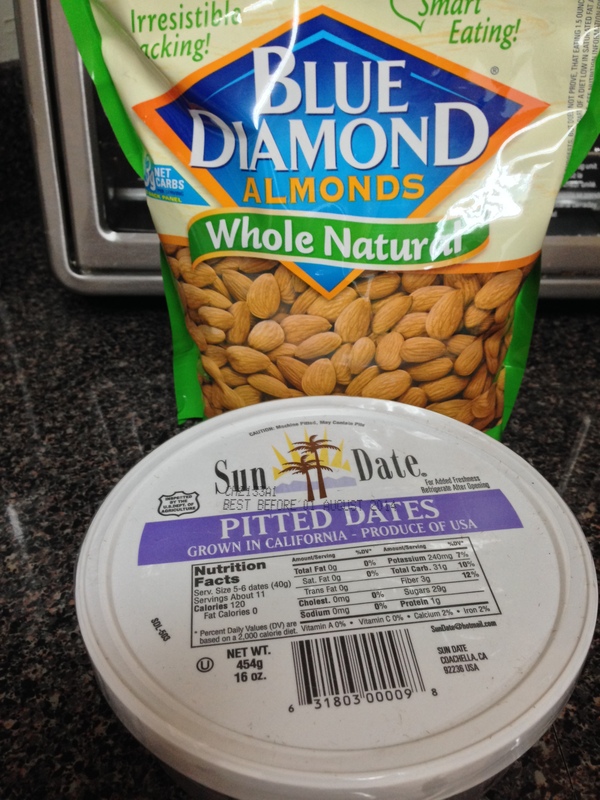 1 cup of almonds is 6 ounces, 1 cup of dried cherries is 4 ounces and 1 cup dates is 6.2 ounces. Sounds yummy, I love anything with cherries.. It does sound good. The favorite treats for Sidney and Shelby are mangoes, carrots, winter squash, and apples. Mom likes them too. What a great idea and looks so simple to make. Also healthy. Thanks! Umm … TOTALLY hungry now! Thanks for sharing this, Rumpy and Jenny! This looks so healthy for the humans. I’ll tell mom so she will have a healthy snack. Yummy!!! Can’t wait to try this!!!!! Love Larabars, but yours looks so delicious!! Ohhhh that sounds good! I will be trying this for sure. Sharing it too! Make these easy, yet good for you candy bars for snacks. They look amazing! Oh they taste amazing too!